The best wedding dress for body type may not be your favorite wedding gown. If you’ve spent just a little time perusing bridal magazines or online bridal lines, you probably have a few favorites you have set your heart on. But you may find yourself disappointed when you actually try on those gorgeous gowns. The most flattering wedding dress on you may not be your favorite on the run-way either. To truly look your best on your wedding day, find a wedding dress that is flattering to your figure. Check out the guidelines below for some suggestions of styles that will compliment your silhouette. Thin brides can wear a variety of gowns, however, ball room gowns are especially flattering. Horizontal pleats and gathers in the bodice area will add body to the thin figure also. Avoid thin straps, strapless gowns and sweetheart (heart shaped) necklines if your bust is also small. Jewel (round) and bateau (straight across from shoulder to shoulder), necklines are attractive on small busted brides. 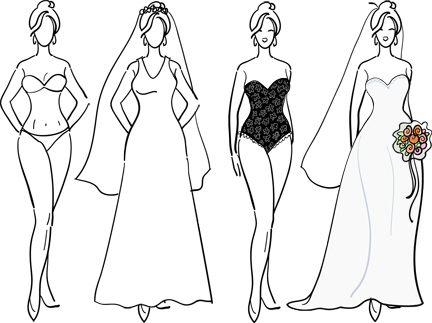 For full figured brides, A-line, drop waist, Basque styles are ideal. Basque waistlines start at the natural waist on the sides and drop to a “V” 2 or 3 inches below the waist in the front elongating the body. An Empire and Asymmetrical waistlines are also very flattering. Empire waistlines run just below the bust line. Asymmetrical waistlines either start at an empire waistline and drop to a natural one, or start at a natural waistline and decline to a dropped waistline, both giving a slimming effect. Add vertical lines in the gown style whenever possible.Avoid slinky fabrics that hug the body and puffy sleeves that add volume to your torso. Unless your bust is quite large, a “V” neck neckline is very attractive for the full figured bride. Straight necklines (such as strapless and square) are also particularly flattering. Wide skirted and A-line gowns will hide your hips and accentuate your waist. Keep your skirt plain and draw attention to your bodice with beautiful beads, sequins and trims. Off the shoulder necklines will add width on top to give balance to your silhouette. An A-line or Basque style gown will minimize the bust area visually. Avoid empire waistlines as they draw more attention to the bust. Sweetheart (heart shapes), strapless and square necklines are attractive styles for the larger busted bride. Avoid jewel (round), halter, “V” neck and bateau (straight across from shoulder to shoulder), necklines as they emphasize the bust area more. Adding height is the goal for petite brides.This is best done with A-Line or sheath gowns, empire waists and high necklines. Avoid very full and drop waist gowns and excessive ornamentation on the skirt and hemline that draws the eye downward. Drop waist and full gowns will draw the eye downward to “shorten” the very tall bride. Adding some horizontal pleats and gathers in the bodice area will also help. A halter neckline is especially attractive on tall brides. Avoid straight gowns such as A-line or sheath styles and high necklines as they will elongate your figure. For the lucky bride who is proportional top and bottom with a nice waistline, the mermaid wedding dress body type is you! “Off the shoulder” necklines and “V” necklines will be especially attractive also. But avoid full, ruffled or excessively ornamented gowns that may make you appear larger than you are. These suggestions may help your dress selection go a little smoother. If you know what to look for, you may find that perfect flattering wedding dress a little quicker. Be sure you take a trusted friend with you as you shop. But don’t take a crowd; too many opinions will just confuse you. And when you find that perfect gown, be sure to keep it in an acid-free environment to keep it in the best condition. Our 100% Cotton Bridal Gown Bag is the perfect place. After your wedding be sure to have your wedding dress cleaned and preserved. 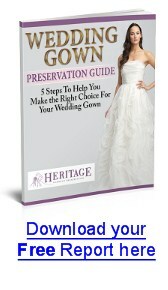 Your cleaned and preserved bridal gown will a treasured memento of your special day. Want to use this article in your ezine or web site? You can as long as you include a link to our website and the copyright above.